← On Multitasking: Can you Multitask ? The blockers to innovation lie in organizational entities and interaction dynamics.. and an important aspect of innovation averseness is clearly manifested in communication patters… an article on HBR blogs lately gave a healthy discussion of the issue, looking at how communication can foil innovation efforts. Communication is the ‘stuff of interconnectedness’ in organizations, and with increase of focus on innovation as an organizational growth engine, the links between communication and leadership and innovation are yet to be explored in a deeper way, especially with the increased focus on collective intelligence (group intelligence), brainstorming, and teamwork as crucial components of innovation success. This includes communication within the core team, in the organization, and with key stakeholders outside the organization, including distribution channel partners, suppliers, journalists, investors and of course, existing and potential customers. Begin in the right place: Communicate Meaning and Purpose. Innovation takes time and costs money so projects that aren’t clearly linked to the “core” are especially prone to failure. innovation teams need this level of clarity to guide their efforts and thinking and your leaders need it to inform decision-making related to innovation and how it contributes to future growth. Keep the vision alive – Look for the long-term. Complexity & uncertainty of innovation make it easy to get lost. thinking should be visible to help teams stay on track and reinforce their goals. Be very clear about processes. Although many aspects of innovation efforts need to be kept confidential and might have sensitive timing issues, the process should not be secret. Successful initiatives are supported by well-defined processes, which become the foundation for successful internal communication. It should be shared broadly in the organization and progress celebrated. Don’t under-communicate. The different teams should be tightly linked and communicate continuously.. General management, human resources, marketing, communications, and sales teams should be informed along the way. Control Cynicism. Healthy skepticism from positive team players is important and vital unlike cynicism. Don’t let jargon hide the truth. Recognize power of words in getting the development team aligned and achieving the positive results. Simplify the language and let interdisciplinary teams and groups work closer and more cooperatively. Widely-Resonating terminology is vital. Scarcity is frequently the driving motive behind innovation efforts, pushing corporations beyond their comfort zones, and squeezing them into innovating their use of resources. How should an enterprise go about inventing something novel and useful? Is there a structured thinking process that reliably produces results? At least 162 different answers have been proposed to that question. That’s the number of invention methodologies my colleagues and I have perused in the course of assembling what we call The World Database of Innovation. Only a small subset of these processes for inventing are based on hard evidence. TRIZ is a model devised by Russian inventor Genrich Altshuller and is an empirically based method, followed by SIT (for “Systematic Inventive Thinking”) and a few other updated versions of it. The“Productivity” method popularized by Tor Dahl is backed up by solid experience data as well. Various consultancies have also tracked their clients’ results from proprietary methods over periods of decades. These several schools of thought have statistically significant information behind their processes for inventing. All of us have heard stories or seen images of resourcefulness under daunting constraints. In our daily lives, moreover, we can see a very persuasive natural experiment playing out in the realm of marketing communications and advertising. The examples are many: Faced with new limits on audience attention, advertisers that once assumed 30-second ad spots now must pack potent messages into the most fleeting of impressions. In an era of marketing budget cuts, they make innovative use of new — and cheaper — media. Needful, especially of tech-savvy talent, they now engage in new forms of partnership, collaboration, and crowd-sourcing. Thus, in an era that anyone would recognize as challenging to marketing, we have seen unprecedented levels of innovation — to the point that an expert today may be old hat in less than 3 months. A Forever21 billboard now reaches out and grabs you. You can test-drive a Mitsubishiwithout leaving your living room. Geo-targeted ads on taxis give you game scores when you’re near Madison Square Garden. Time Warner advertises to you when you drive into a coverage area. It’s almost as if the constraints coming from all sides have squeezed the advertising world so hard that incredible new things are starting to pop out of it. By deliberately imposing scarcity of one kind or another on their problem-solving, inventors become demonstrably more creative, and the ideas generated under such conditions enjoyed greater success in the marketplace and society than ideas invented in more “blue sky” modes. Thus, the SIT method relies heavily on “subtraction,” “constraint,” and “closed world” techniques. Of the 40 methods spelled out by the TRIZ approach, 8 involve what we would term scarcity. How do you define innovation? Something different that has impact. What are different types of innovation? consider different strategic intents (e.g., create a new category, extend current business) or innovation mechanisms (e.g., new product, distribution channel, marketing approach). How to spot opportunities for innovation? Go to the source: the customer you hope to target. Which customers to target? Look beyond your best customers to those who face a constraint that inhibits their ability to solve the problems they face in their life. What should I look for? As Drucker said, “the customer rarely buys what the business thinks it sells him;” look for a job-to-be-done, an important problem that is not adequately solved by current solutions. How should I look? Start with deep ethnographic research; avoid focus groups! How do I come up with an idea? Remember the Picasso line “good artists copy, great artists steal;” seek to borrow ideas from other industries or geographies. What is disruptive innovation? An innovation that transforms a market or creates a new one through simplicity, convenience, affordability or accessibility. What is the best way to disrupt a market? Embrace the power of trade offs. Seek to be just “good enough” along historical performance dimensions but introduce new benefits related to simplicity or affordability. What does “good enough” mean? Performance above a minimum threshold to adequately solve a customer’s job to be done; sacrificing performance along traditional dimensions can open up new avenues to innovate. What is a business model (and how to innovate one)? How a company creates, captures, and delivers value; codifying the current business model is the critical first step of business model innovation. How can I “love the low end”? Build a business model designed around the low-end customer’s job-to-be-done. How can I learn more about my idea? Design and execute “high return on investment” experiments to address critical unknowns. How can I get other people behind my idea? Bring the idea to life through visuals and customer testimonials. How long does it take new businesses to scale? Almost always longer than initial projections; be patient for growth and impatient for profits. Why is innovation so important? The “new normal” of constant change requires mastering perpetual transformation. Why is innovation so hard? Most organizations are designed to execute, not to innovate. Who are your influences? Academics like Clayton Christensen and Vijay Govindarajan, leading-edge innovative companies like Procter & Gamble and Cisco Systems, and thoughtful writers like Michael Mauboussin and Bill James. How do I encourage innovation in my organization? Stop punishing anything that smells like failure, recognizing that failure is often a critical part of the innovation process. What is “the sucking sound of the core?” The pull of the core business and business model that subtly influences new ideas so they resemble what the organization has done before. What is an innovation “safe space”? An organizational mechanism that protects innovators from the sucking sounds of the core. How should I form and manage innovation teams? Keep deadlines tight and decision makers focused. What is in a good innovation strategy? Overall goals, a target portfolio for innovation efforts, a mechanism to allocate resources to achieve that portfolio, and clearly defined goals and boundaries for innovation. What is the best way to manage an innovation portfolio? Make sure you correctly capture current activities and measure and manage different kinds of innovations in different ways. What does ‘prudent pruning’ mean? Recognizing that destruction is often a critical component of creation. What role should senior executives play in innovation? A big one. How can I personally become a better innovator? Practice – innovation is a skill that can be mastered. How can I find more resources for innovation? Shut down “zombie projects” that are a drain on corporate resources. How can I more quickly turn good ideas into good businesses? Remember what Edison said – genius is “1% inspiration and 99% perspiration;” get ready to sweat. Has anyone built the ability to innovate at scale? An increasing number of companies, such as Google, Apple, Procter & Gamble, Amazon.com, Cisco Systems, Godrej & Boyce and General Electric. The below discussion is interesting because it touches on the important clash between efficiency and innovation… between trying to optimize processes and operations, and the possible loss of versatility and innovation that it can cause. “I’m told there’s some 3M inside that phone,” I say. Buckley replies, “There’s lots of 3M inside.” He can’t say exactly what 3M (MMM, Fortune 500) gadget is in the iPhone; Apple’s (AAPL, Fortune 500) skittish about such things. But point well made: 3M is everywhere. Apple and many others couldn’t do what they do without 3M. 3M produces a mind-bending 55,000 products. Some of them you know — Post-it notes, Scotch tape, Dobie scouring pads, Ace bandages, Thinsulate insulation. But most you don’t, because they’re embedded in other products and places: autos, factories, hospitals, homes, and offices. Scientific Anglers fly-fishing rods and Nutri-Dog chews? Yup. They also come from 3M. Somehow they all add up to a business with $23.1 billion in revenue and $3.2 billion in net income in 2009, placing 3M at No. 106 on the Fortune 500. 3M has long been synonymous with innovation. Founded in 1902 as the Minnesota Mining & Manufacturing Co., it has deployed a range of practices to promote out-of-the-box thinking. Long before Google (GOOG,Fortune 500) gave its engineers one day a week to pursue their own ideas, 3M let its researchers do the same with up to 15% of their time. In another unusual practice, 3M awards annual Genesis Grants, worth as much as $100,000, to company scientists for research. The money is allocated by their peers and is spent on projects for which “no sensible, conventional person in the company would give money,” says Chris Holmes, vice president of 3M’s abrasives division. Despite such practices, many inside and outside 3M, including Buckley, think 3M lost some of its creative juice under James McNerney, the acclaimed GE alum who led the company from 2001 to 2005 and is now CEO of Boeing (BA, Fortune 500). It’s not that McNerney, the first outsider to run 3M, did a poor job. The company had become sluggish, and McNerney whipped it into shape. He streamlined operations, laid off 8,000 people, and imported Six Sigma management techniques, popularized by GE, to analyze processes, curb waste, and reduce defects. “He brought the discipline and the focus on execution we needed,” says Mark Colin, who oversees a 3M business that makes products for mobile devices. Earnings grew, margins improved, and shareholders cheered. The board turned to Buckley, now 63, who had demonstrated his business chops as CEO of Brunswick, an Illinois company known for bowling gear and boats. But the most important thing to know about Buckley, a Brit with a Ph.D. in electrical engineering, is that he’s a scientist at heart who has several patents to his name. In other words, he’s a good fit for 3M. “This is to me an engineer’s and scientist’s Toys ‘R’ Us,” Buckley says. Buckley has laid out some clear business goals for the company. He wants managers to protect and strengthen 3M’s core businesses, like abrasives, industrial tapes, and optical film. He wants 3M to develop lower-cost products to compete in emerging regions. He wants 3M to be part of future growth markets (example: renewable energy, water infrastructure, and mobile digital media). Above all, Buckley has been an outspoken champion of the labs. Last year, despite the recession, he kept R&D spending at more than $1 billion. Says management guru Ram Charan, who advises 3M: “George has accelerated the innovation machine by devoting his personal time, his energy, his focus, to empowering the researchers, opening up their minds and urging them to restore the luster of 3M.” The results speak for themselves: The percentage of 3M’s revenue from products introduced in the past five years is back to 30% and may reach the mid-30s by 2012. 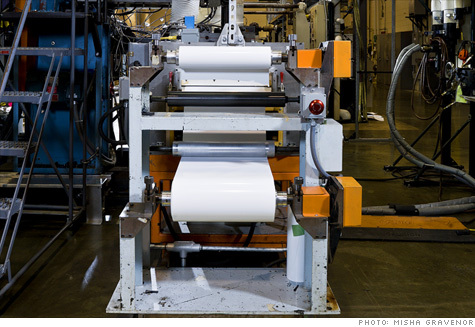 Six Sigma remains in force in 3M’s factories, but it’s gone from the labs. Each of 3M’s six major business units has its own research lab, which is product-focused, while the corporate research staff works on core technologies that are shared by all the businesses. Altogether, 3M employs 6,500 people (out of about 75,000) in R&D. It’s the core technologies — things like abrasives, adhesives, imaging, and films — that drive growth at 3M, often in unexpected ways. Consider microreplication, a process 3M uses to create tiny, precisely shaped structures that can be arranged on a variety of surfaces; the technology dates to the 1960s, when it was used to make low-cost overhead projectors for schools and offices. The projectors are mostly gone, but microreplication is alive and well, embedded in 3M products that enable traffic signs to be brighter and golf gloves to deliver a tighter grip with less effort. Currently 3M is seeking regulatory approval for a drug-delivery device — a skin patch made of pain-free microneedles that barely pierce the skin and could replace hypodermics. It’s safe to say that no 3M product will generate the buzz of, say, the next iPhone. But 3M has never been about inventing the Next Big Thing. It’s about inventing hundreds and hundreds of Next Small Things, year after year. Things like Cubitron II. Buckley explains that Cubitron II is an industrial abrasive that cuts faster, lasts longer, sharpens itself, and requires less elbow grease than any other abrasive on the market. Introduced last year, it’s selling like crazy, to the CEO’s delight. “How the heck do [you] innovate in abrasives?” he asks. “A 106-year-old business for us! For goodness’ sake — it’s sandpaper!” Catching himself a moment later, he jokes, “I probably need to get out more.” Maybe so, but you can understand what he’s excited about: little things like grains of sand that add up to the big business that is 3M. This entry was posted in Business, Leadership, Management, Strategy, Technology, Entrepreneurship and Innovation and tagged Brainstorming, Collaboration, Communication, communication mistakes, Communication Tips, Creativity, effective communication, effective leadership, Good Communication, Innovation, intelligent innovation, interpersonal skills, Leadership, Organizational Capabilities, Organizational Culture, reasoning, Strategy, teamwork. Bookmark the permalink.